"No Laws. No Limits. One Rule. Never Fall In Love." Aspiring writer Christian tells the story of how he fell in love in 1899 Paris with an entertainer and prostitute at the burlesque cabaret Moulin Rouge. After joining the Bohemian movement Christian meets a group of performers and finishes writing their proposed stage show that they intend to sell to Zidler, the owner of the Moulin Rouge. 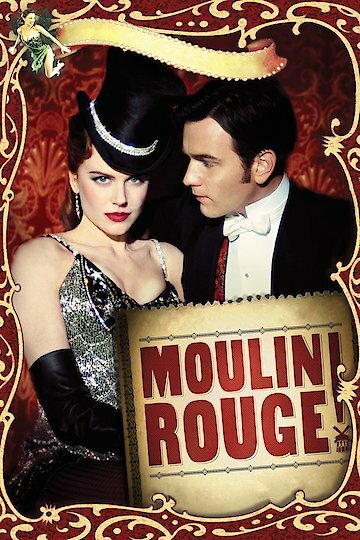 An arrangement is made for Christian to meet with the Moulin Rouge's star Satine in her rooms to present the show to her. Christian and his new friends are unaware that a mistake has been made and Satine was meant to meet with the Duke of Monroth who could potentially invest in the club. Although the mix up is soon realized Christian has already fallen in love with Satine who seems charmed by hims. The Duke interupts the pair and, as an alibi, they present the show idea originally meant for Zidler and Satine. On the condition that he begin seeing Satine, the Duke agrees to finance the play. Satine and Christian begin a secret romance. During practice Satine falls ill and Zidler learns that the tuberculosis she's suffering from has grown worse and that she will die soon. Satine tries to convince Christian that they can't carry on their relationship but he affirms it by writing a love song for her into the show. The Duke realizes their romantic involvement and demands the entire play be changed. In order to save the original ending rather than the Duke's demanded, Satine makes an offer to spend a night with him. Satine realizes she can't betray Christian and, when the Duke tries to take advantage of her, she is rescued by a fellow dancer and reunited with Christian. The Duke threatens to kill Christian and Zidler tells Satine that she is dying and must be with the Duke to save Christian's life. She ends her relationship with Christian, claiming that she doesn't love him. Trying to prove otherwise he follows her onstage at the show and has an angry confrontation that ends with his storming away. Satine sings their secret love song and Christian returns to sing with her. The Dukes attempt to kill Christian fails. Once their song ends and the curtain closes, Satine dies in Christian's arms. Moulin Rouge is currently available to watch and stream, buy on demand at Amazon, Vudu, Google Play, iTunes, YouTube VOD online.